So whils browsing on the pages of Net-a-Porter i landed on 3 gorgeous items a girl can but dream of owning! I love th classic shape of the boot, they are really versatile and would be great to wear during the day in a casual fashion or in the evening dressed up. I love the contrast of the colours! and i have heard brights will be in this year, so again the perfect addition to the shoe closet. A girl can deffinatly dream im a massive fan of his designs, i love the uniqueness he brings to his work and this is no acception. One day i will own this bag! What do you think of these gorgeous accessories? Oh wow! 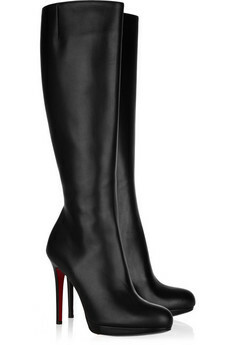 I need those boots and Jimmy Choo's!! I love Alexander McQueen, one of my favourite designers. I dream of one day owning one of them clutches.